Spanish rumba/flamenco singer, composer and guitarist (Madrid, 1956 - Málaga, 2004). Manzanita is an artist with lineage: the son of cantaor and bailaor Rafael Ortega García and bailaora Trinidad Heredia Jiménez; and the nephew of Manolo Caracol. At nine years of age, he began playing the guitar at the Madrilenian tablaos where his father used to sing - Café de Chinitas and Los Canasteros -, becoming one of the most sought-after guitarists for accompaniment. When he was just 11, he accompanied cantaor Enrique Morente on his world tours. In 1974, he formed the group 'Los Chorbos' together with Alfonso Veneno, Miguel and Amador Losada, contributing to the so-called ‘Caño Roto sound’ which gave a “flamenco quality” to the rumba. Three years later he began his solo career, and in 1978 his first album appeared, ‘Poco ruido y mucho duende’, which was a big hit. Other albums came afterwards such as ‘Caja de música’, ‘Sueño de amor’, ‘Espíritu sin nombre’, among many other titles. Upon setting up residence in Catalonia, his career slowed down, although in Barcelona his guitar was called on by artists such rumbero Gato Pérez and cantaor Duquende. In 1995, he returned to the stage to star along with the group Ketama in the party closing the film ‘Flamenco’ by Carlos Saura, performing the song ‘Verde’ with lyrics by Lorca. By the hand of producer Paco Ortega, around 1998 he revised his greatest hits and his extensive discography was published once again. 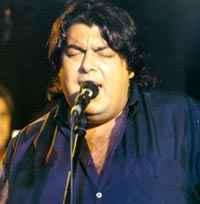 Manzanita died at the age of 48 in Alhaurín de la Torre (Málaga) on December 6th, 2004.